WATER GARDENS: Over the past decade, water gardens have become extremely popular for homeowners looking to add a soothing, peaceful, tranquil feature to their backyard landscape. A water garden is a living, breathing, ecological entity that can provide breathtaking beauty to any backyard. Pond or water garden aesthetics include rare and exotic Japanese koi fish, tropical plants and flowers, calming waterfalls or fountains, colorful rocks or stone work, and even unique underwater lighting. 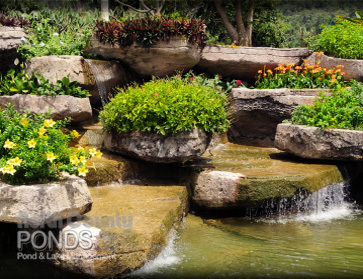 Water gardens add an appealing element to your backyard or residential property. Build your water garden in an area that gets substantial amounts of sun. Water gardens and aquatic plant life thrive with at least 6-8 hours of direct sunlight per day. Add plants that are not too evasive or have extremely rapid growth rates. 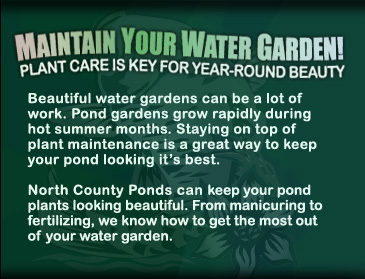 Place plants in appropriate areas of your pond that are suitable for that particular pond plant. For example; bog plants go in shallow areas, floating plants go great in header ponds, while submerged plants and water lillies should be placed in deeper areas of the pond. Correct aquatic plant placement, plant potting, plant fertilizing, and plant manicuring are necessary to keep your water garden looking great and functioning properly as an ecosystem. With appropriate planning, pond owners can enjoy a healthy balance between living and decorative features of a water garden while keeping pond maintenance costs at a minimum. POND PLANTS: Pond plants are essential to maintain optimum water balance in your water garden. They can provide an excellent source of oxygen to the pond, give coverage and shelter to your koi, can be used to redirect water flow, and can play a big role in the fight against algae. If your pond is not equipped with an U.V. sterilizer, we strongly recommend using a variety of aquatic plants to your pond to help prevent single cell (green water) algae blooms. Pond plants fight algae by "starving" the algae from it’s food supply. Pond plants absorb the minerals and carbon dioxide in the water, keeping the algae from taking root. Our recommendation for water gardens without U.V. sterilization, is for 30%-50% aquatic plant surface coverage. This will greatly improve pond filtration and help limit rapid algae growth.